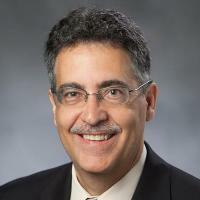 Dr. Henriquez is also a Professor of Computer Science and Co-Director of the Center for Neuroengineering. Henriquez's research interests include large scale computing, heart modeling, and brain modeling. A breakdown of the normal electrical activation sequence of the heart can sometimes lead to a state of ventricular fibrillation in which the heart ceases to function as an effective pump. Abnormal rhythms or arrhythmias often result after an episode of ischemia (a localized reduction of blood flow to the heart itself) which affects both the ionic processes necessary to elicit an impulse and the passive electrical properties of the tissue. Identifying the complex mechanisms of arrhythmogenesis will require experimentation as well as mathematical and computer models. Current projects include the application of the bidomain model to diseased tissue to investigate how changes in tissue structure (both natural and diseased induced) and changes in ionic current flow influences the nature of conduction and the onset of arrhythmia. Dr. Henriquez's group is also interested in developing realistic models that will enable investigators to better interpret electrophysiological measurements made in the clinic. For example, activation maps at the surface of the heart are typically constructed based on the detection of specific features of the surface extracellular recordings. However, for complex activation, such as might arise during an arrhythmia, the features are difficult to distinguish. The use of models that simulate both activation and the resulting extracellular potential and the application of signal processing techniques can lead to a tool for constructing more meaningful maps from experimental recordings during abnormal conduction. This works involves direct interaction with experimental research performed in the Experimental Electrophysiology Laboratory under the direction of Dr. Patrick Wolf and the Cardiac Electrophysiology & Tissue Engineering lab under the direction of Dr. Nenad Bursac. Henriquez's research interests include large scale computing, heart modeling, and brain modeling. Li, G; Henriquez, CS; Fröhlich, F, Rhythmic modulation of thalamic oscillations depends on intrinsic cellular dynamics., Journal of Neural Engineering, vol. 16 no. 1 (February, 2019), pp. 016013 [doi] [abs]. Gokhale, TA; Asfour, H; Verma, S; Bursac, N; Henriquez, CS, Microheterogeneity-induced conduction slowing and wavefront collisions govern macroscopic conduction behavior: A computational and experimental study., Plos Computational Biology, vol. 14 no. 7 (July, 2018), pp. e1006276 [doi] [abs]. Zhang, X; Foderaro, G; Henriquez, C; Ferrari, S, A Scalable Weight-Free Learning Algorithm for Regulatory Control of Cell Activity in Spiking Neuronal Networks., International Journal of Neural Systems, vol. 28 no. 2 (March, 2018), pp. 1750015 [doi] [abs]. Rossi, S; Gaeta, S; Griffith, BE; Henriquez, CS, Muscle Thickness and Curvature Influence Atrial Conduction Velocities., Frontiers in Physiology, vol. 9 (January, 2018), pp. 1344 [doi] [abs]. Barth, BB; Henriquez, CS; Grill, WM; Shen, X, Electrical stimulation of gut motility guided by an in silico model., Journal of Neural Engineering, vol. 14 no. 6 (December, 2017), pp. 066010 [doi] [abs].